Tap Tap Revenge started life as a “jailbreak” app for the iPhone even before Apple published a Software Development Kit (SDK) or opened the App Store, so it’s no wonder that this music rhythm game is a monster hit. 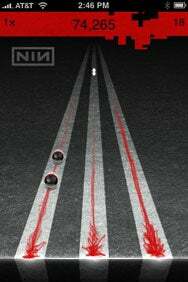 Tapulous, taking what it learned with the “regular” (and free) version of Tap Tap Revenge ( ), has spun off a new $5 product called Nine Inch Nails Revenge. But why would you pay $5 for a new version of a free game? The answer is simple: As the name implies, this variation on Tap Tap Revenge features music licensed by industrial rock band Nine Inch Nails. And if you’re a fan of NiN’s hard-driving brand of music, it’s fantastic. The Downward Spiral: If you like Nine Inch Nails, you’d have to have a head like a hole not to enjoy Nine Inch Nails Revenge. The soundtrack for Nine Inch Nails Revenge features a total of 13 tracks from the band’s two latest albums—The Slip and Ghosts I-IV. Tapulous says that the songs were hand-picked by NiN founder Trent Reznor himself. Not only is the soundtrack to Nine Inch Nails Revenge different, but, in fact, the game has been extensively reworked. The most obvious difference is a NiN-inspired skin that rewraps the colorful game in shades of black, white, and red—very befitting Trent Reznor’s alter ego. The razor blade and blood motif replaces the rainbow colors used in the original game. The new version also features level unlocking. To gain access to all the songs and all four difficulty levels, you must play through. A tutorial is also included if you’ve never played the game before. Gameplay in Nine Inch Nails Revenge is the same as the first game—it’s a rhythm-matching game cut from the same cloth as Guitar Hero. You must tap the bottom of the screen in time with descending black bubbles. Do so, and you’ll amass points. String enough together in a row, and you’ll earn multipliers that will increase your score. A “Revenge” mode can also be activated which temporarily doubles your point value as long as you’re able to continue to string together notes successfully. The game will also display arrows, an optional feature you can turn off— but with it on, you occasionally have to shake your iPhone or iPod touch up and down, or left and right, again, in time with what’s happening on the screen. The game also features a two-player mode which lets you play against another gamer who’s on the same iPhone. Like Tap Tap Revenge, players square off on opposite sides and do the same tapping technique using two play fields offset with forced perspectives. Unlike Guitar Hero, the song doesn’t stop playing or degrade if you miss notes. Your point value goes down, however, and it’s easy to fall into negative territory if you mess up badly. An online registry (requiring you to create a free profile with Tapulous) lets you track your high scores against the scores of other players. There are a couple of things that irritate me about Nine Inch Nails Revenge, and they’re shortcomings shared by its free sibling. The “Challenge a Friend” and “About Nine Inch Nails” buttons in the game quit you out of the game and open up your e-mail client and Safari respectively; I think it’s bad manners for an application to quit without asking you permission first. I also find Tapulous whole user registration system rather obnoxious—I’d prefer to just be able to upload my high scores using an arbitrary user name rather than have the company presumably track what I’m doing with its applications. (The same system is used for Twinkle, Tapulous’ Twitter client for the iPhone). I understand that Tapulous says it won’t use the personal information, but it still seems like an unnecessary hoop to jump. Nine Inch Nails Revenge is compatible with any iPhone or iPod touch running the iPhone 2.x software update.